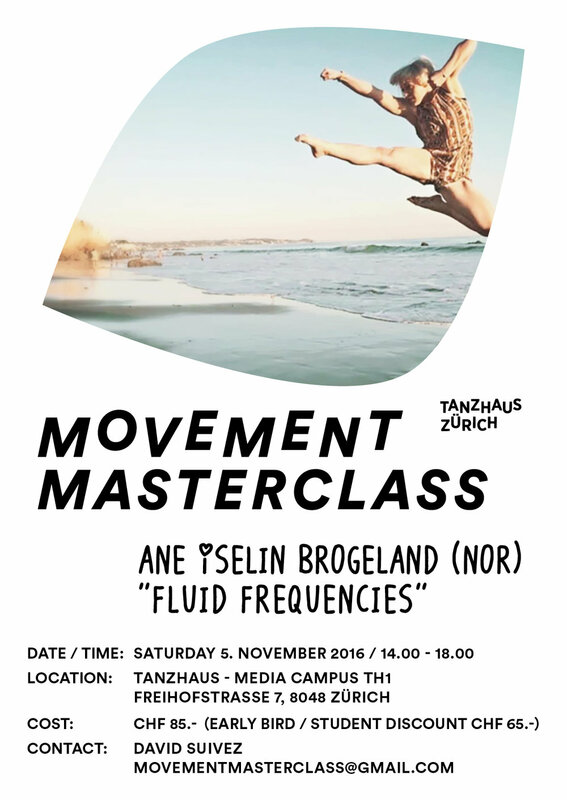 Fluid Frequencies is a physical, imaginative, and guided performance practice to explore and create circumstances within familiar and unfamiliar areas of body, mind and soul. Digging into the depths of who we really are and what we really want, dropping the guards and heartfully accept of “what is” can be expressed in many different ways. In Fluid Frequencies we approach that vulnerable and challenging space, becoming aware of ourselves through a continuously journey of exploration, discovery and sharing. - “Being” versus “performing” Through guided improvisational tasks we will connect to our imagination, our sounds, our emotions, our dancing stories, and the journey of our energy in between - sourcing energy while moving. Listen, feel and sense what is within and around, and move from there. The group will hold you, make you stronger, more aware and soft at the same time. Ane Iselin Brogeland is a Norwegian dancer, improviserand performer, currently based in Hamburg, Germany, being part of the the Sticky Trace Company. She holds a BA in Dance from the University of Chester (UK), an MA in Performance from the University of Chichester (UK) and has nationally and internationally experience with the works by Jonathan Burrows, Rick Nodine, Ofra Idel and Lila Dance. She regularly teaches and holds workshops and enjoys sharing her love for movement with people across the world.